Ive recently begun using Discourse as the software behind a Roleplayers forum. 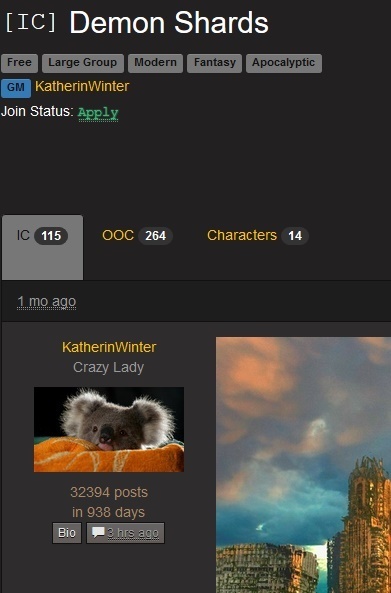 It occurred to one of my users that it would useful to be able to utilize Topic tabs to be able to avoid clutter elsewhere in the forums for things such as characters and out of character talk. To get a better idea of what i’m talk about, the link below gives an example of what it looks like on a another Roleplay site of similar type (created another Discourse user, Dan Neumann, using what i think is his own software), as well as a link t the site itself if you wish to play with its functionality. Honestly speaking, i cant think a use for this is any place other than a role play site, or perhaps an inter-business site in which one might be able to use these tabs to separate out topic relevant conversation on a project or something, but i would certainly appreciate if there was a way to do it. We have the “whisper” feature which lets Staff talk privately in a topic (and trust level 4 users, if enabled) but there are no plans to extend this to arbitrary groups or users. I like how they implemented that feature in the forum you linked to, but I don’t think that tabs would work well with infinite scrolling. I don’t know if you’ve already thought of this, but what might work well is to use the “Reply as linked topic” feature and start the meta topics manually. You could put the meta topics in their respective categories or subcategories and then unlist those categories from showing up on the main page. That might keep the forum uncluttered. I had thought of this (and am implementing it), the alternative was just better. Thanks for making the suggestion though, because it is a good one.